On the 17th (Mon), delve into the lush surroundings at Grass Farm Nursery and then admire nature's wide array of creatures at Deer Park, Ashok Vihar, Jaipur. On your second day here, see the sky in a new way at Jantar Mantar - Jaipur, take an in-depth tour of City Palace of Jaipur, then step into the grandiose world of Amber Palace, and finally make a trip to Jagat Shiromani Ji Temple. To see more things to do, maps, where to stay, and tourist information, you can read our Jaipur road trip planner. Singapore, Singapore to Jaipur is an approximately 9-hour flight. You can also drive. The time zone changes from Singapore Time to India Standard Time, which is usually a -2 hour difference. Traveling from Singapore in December, expect nights in Jaipur to be much colder, around 11°C, while days are a bit cooler, around 30°C. Wrap up your sightseeing on the 19th (Wed) to allow time to travel to Ranthambore National Park. Kick off your visit on the 20th (Thu): explore the activities along Surwal Lake, take in the spiritual surroundings of Trinetra Ganesh Temple, then contemplate the long history of Ranthambore Fort, and finally stop by Village Women Craft. For photos, reviews, and other tourist information, go to the Ranthambore National Park travel route planner . Do a combination of train and taxi from Jaipur to Ranthambore National Park in 3.5 hours. Alternatively, you can drive. Finish your sightseeing early on the 20th (Thu) so you can travel to Gwalior. The historic city of Gwalior offers an introduction to the medieval dynastic politics of the region. Start off your visit on the 21st (Fri): delve into the distant past at Gwalior Fort, examine the collection at Sarod Ghar, admire the striking features of Jai Vilas Palace, then delve into the distant past at Bateswar group of temples - Morena Gwailor, and finally admire the landmark architecture of Chhatris of Scindia Dynasty. To find more things to do, maps, other places to visit, and tourist information, read our Gwalior trip itinerary website . Traveling by car from Ranthambore National Park to Gwalior takes 6.5 hours. In December, daily temperatures in Gwalior can reach 30°C, while at night they dip to 10°C. Wrap up your sightseeing on the 21st (Fri) early enough to travel to New Delhi. 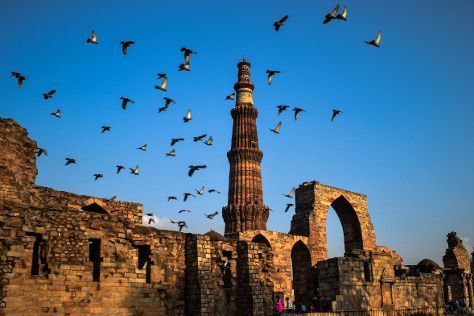 Kick off your visit on the 22nd (Sat): take in panoramic vistas at Qutub Minar, get your game on at Barney's Den, then take in nature's colorful creations at Humayun's Tomb, and finally contemplate the long history of India Gate. Here are some ideas for day two: take in the spiritual surroundings of Birla Mandir Temple (Lakshmi Narayan), contemplate the long history of Gurudwara Bangla Sahib, and then admire the natural beauty at Akshardham. For more things to do, ratings, photos, and more tourist information, read our New Delhi trip planner . You can drive from Gwalior to New Delhi in 6 hours. In December in New Delhi, expect temperatures between 27°C during the day and 10°C at night. Wrap up your sightseeing by early afternoon on the 24th (Mon) to allow enough time to travel back home.